The treatment of Meibomian Gland Dysfunction essentially revolves round warming the waxed up glands so that it can be expressed and absorbed away by lid hygiene methods such as Blephasol, treating the bacterial overgrowth by using an anti-bacterial cleaner such as Sterilid, oral supplements containing fish and flax oil, such as Theratears Nutrition, to improve quality and quantity of meibomian oils secreted and reduce inflammation, hypotonic artificial tears to restore a normal tear osmolarity as the excess evaporation caused by the deficient lidid layer raises the "saltiness" of the tears, damaging the ocular surface. In addition we can use topical lipid layer supplements to top-up the deficient lipid layer, hopefully reducing evaporation. Tetracycline family drugs can sometimes help change the composition of the lipid secretions to lower their melting point. Normally meibomian secretions have a melting point of 32-35 degrees C, ie they are liquid at normal eyelid temperature. In MGD it is higher say between 35-40degrees C, forming a wax which occludes the meibomian gland orifice. 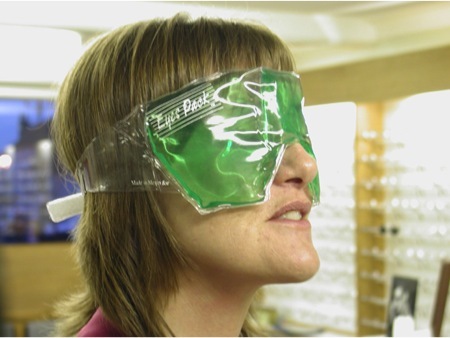 We prefer the use of a product called the “EyesPack”, which consists of a heat retaining gel, which is warmed in boiling water and then worn as a blindfold for 2-3 minutes before lid hygiene. As any heat treatment as a side effect ,can cause capillary dilation of the blood vessels of the ocular surface and eyelids which in turn, can facilitate the release of inflmmatory mediators such as histamine, leading to increased inflammation, it is important to cool the eyes down after treatment. A second Eyes-Pack kept in the freezer, removed for a couple of minutes before use, prevents this happening, by causing capillary constriction. The eyes are much less red and "puffy" as a result. 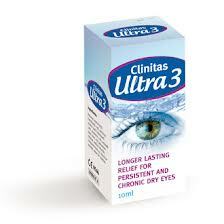 The cold Eyes-Pack is useful in cases of ocular allergy, such as in the Hay Fever season. Fish oils should be processed under nitrogen to maintain freshness and molecularly distilled to remove mercury and any other heavy metals. Ideally flaxseed oil should not contain the ligand portion because phytoestrogens have potential to make eyes drier. 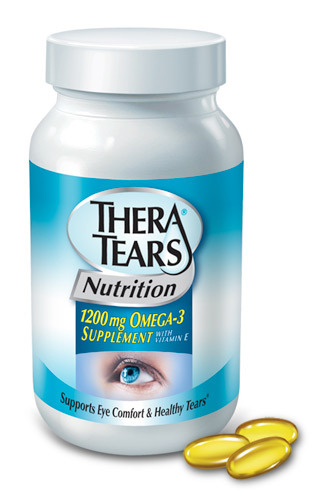 Theratears Nutrition is the only ocular Omega 3 supplement that has had the plant hormones, the phytoestrogens removed. 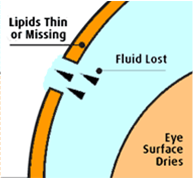 One of the most significant consequences of this increased tear osmolarity or extra-salty tears, is that the surface of the eye loses water by osmosis to the more concentrated tear film. One of the most susceptible parts of the ocular surface to this damage caused by osmosis are the mucous secreting glands on the conjunctival surface, called Goblet Cells. Most of the Goblet cells lie on the “white of the eye” either side of the cornea. The mucous film that goblet cells secrete, coats the eye and “holds” the watery component of the tears in place, keeping the ocular surface hydrated and protected. So although the primary cause of the tear film change is excess evaporation due to reduced lipid secretions, the tear film instability is exacerbated by the consequent death of the mucous secreting goblet cells. Dry eye specialist, Jeff Gilbard researched this problem for many years at the Schepens Eye Institute, and as a result developed a unique eye drop called Theratears, that mixed with the over-salty tears of the patient with evaporative dry eye to restore normal tear osmolarity, or saltiness. Fortunately when normal saltiness is restored to the tear film, goblet cells re-populate, with a consequent improvement in tear film thickness ensuing. This results in reduced signs and symptoms of dry eye. Theratears drops also address other problems associated with dry eye, namely electrolyte imbalance and the increased friction between the eye-lid margin and the ocular surface (Lid-Wiper Epitheliopathy). In particular, there is an imbalance of the sodium and potassium levels afall in bicarbonate levels in dry eye that is addressed by the regular instillation of Theratears lubricant eye drops. The use of punctual plugs increases retention time of the Theratears drops, ensuring that their beneficial effects last for much longer. The portion of the upper lid that is in contact with theocular surface is named the “Lid-Wiper” and “Lid-wper Epitheliopathy” is when this portion of the upper eyelid becomes traumatised and inflamed. 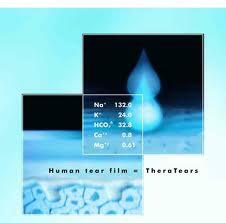 The oily layer covering the tears is hyrdophobic and would not naturally adhere to and spread across the watery layer of the tears if it were not for a thin bipolar layer of phospholipid. Being bipolar it has both a hyrophobic and a lipophobic end to its molecule, and thus holds the oily layer in place over the watery layer of the tears. Some individuals benefit from supplementing their phospholipid layer. 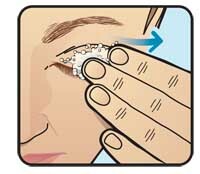 This is done by spraying the Eye Logic Spray onto CLOSED EYELIDS from about 4 inches away, keeping them closed for 15-20 seconds. Over the next 2-3 hours the liposomal phospholipids warm up and migrate over the lid margin topping up the bipolar layer and improving tear quality. 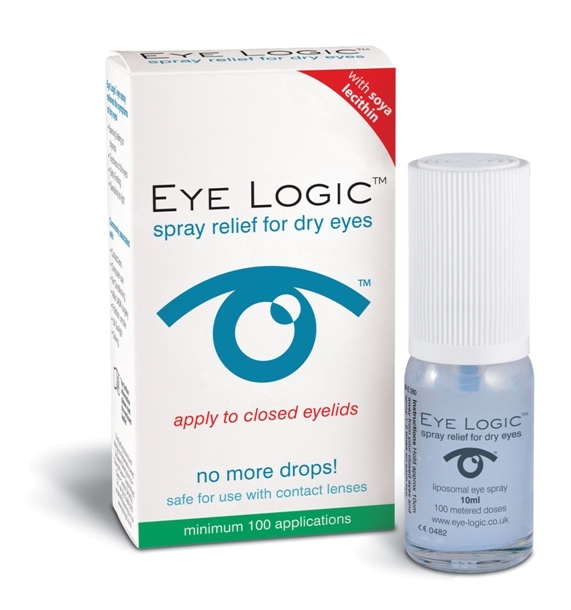 The principal active ingredient of Eye Logic eye spray is the phospholipid phosphatidylcholine, found in soy lecithin and also the most common phospholipid in natural tears. Phosphatidylcholine is present in Eye Logic ™ eye spray in the form of tiny lipid globules known as liposomes. The effectiveness of Eye Logic eye spray is only possible through the revolutionary use of these liposomes, which are the key to effective delivery of the phospholipids to the eye's lipid layer. There are a few brands of Liposomal sprays, that fall into 2 categories. 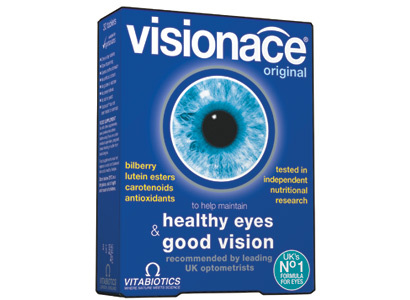 The constituents of Eye Logic and Optrex Actimist are the same, Eye Logic retails at approx £2.00 cheaper than Actimist. The Boots and Tescos own brand products were shown to be inferior to the Actimist/Eyelogic formulation as far as comfort and Tear Break Up Time in a study by Heiko Pult at Cardiff University recently (abstact of article see below). 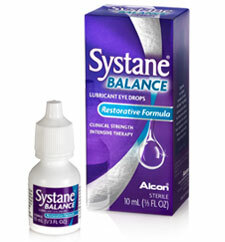 Systane Balance is bottled Dry Eye Drop that combines both a phospholipid and a mineral oil, with a typical preserved artificial tear eye drop. Abstract: PurposeTo evaluate the effect of three different liposomal eye sprays on ocular comfort and tear film stability.MethodsOptrexActiMist (AM, Optima-Pharma, Germany) was applied onto one, randomly selected eye of 80 subjects (female=49; mean age=49 years±18.6 SD) in a multi-centred, double-masked study. DryEyesMist (DEM, Boots) or TearMist (TM, Tesco) was applied onto the contralateral eye in randomized order. 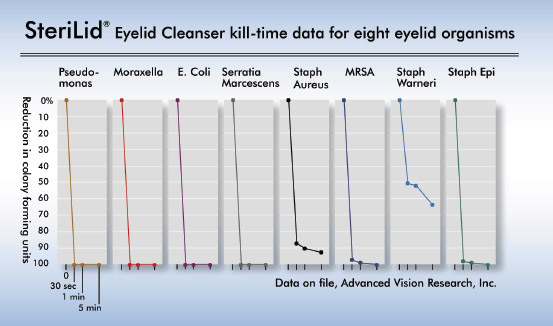 Over-all symptoms were investigated using the Ocular Surface Disease Index (OSDI). Ocular comfort (visual-analogue scale 0–100 [100=perfect]) and non-invasive tear film stability (NIBUT) of each eye was evaluated before application (randomized order) and were again measured 10min after application. Effects of products on ocular comfort and NIBUT were calculated as “factor” (=after-treatment/before-treatment). Differences between measurements were analysed by ANOVA repeated measurements and differences between groups by the dependent t-test (or the non-parametric equivalent).ResultsOSDI-scores (mean=8.1±9.0 SD), comfort (65±24) and NIBUT (12s±12.3) were statistically similar between centres (p>0.400). Comfort and NIBUT were not different (p>0.14) between product groups before application. Comfort and NIBUT improved significantly after application of AM (p<0.001) but worsened with the comparing products (p<0.058). Comfort improved by a mean factor of 1.5 (±0.82 SD) after application of AM but decreased after application of the comparing products (DEM: 0.9±0.33; TM: 0.9±0.34). Both factors were significantly better in AM (p<0.027).ConclusionThe original liposomal eye-spray ‘OptrexActiMist’ significantly improved ocular comfort and tear film stability while ‘TearMist’ or ‘DryEyesMist’ worsened both criteria. 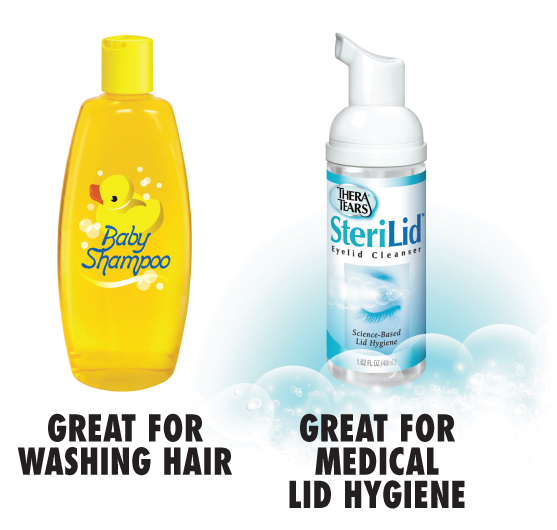 The latter two products may not be clinically effective in the treatment of dry eye.